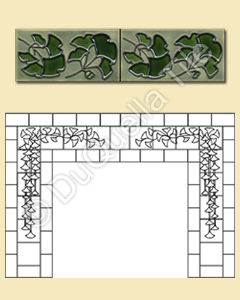 Fireplace tiles, especially decorative fireplace tiles, make a beautiful focal point of your fireplace. 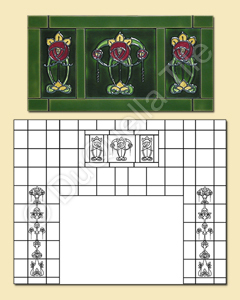 Whether your style choice is Art Deco, Arts and Crafts, Art Nouveau, Traditional, Mid-Century or Modern, we can create the perfect tile for your fireplace surround. 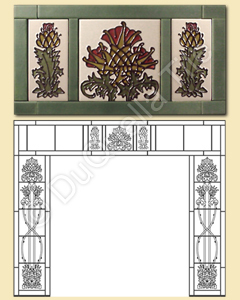 Fireplace tile ideas can be inspired by our SQUARE TILE COLLECTION and also our FLORAL BORDER TILES. Choose your favorite and let us develop the pattern into a fireplace tile layout that is designed for your surround dimensions. There are fireplace ideas and photos in our INSTALLATION GALLERY. Get your tile in the COLORS you want ...at no additional charge ...and in the SIZE you need. 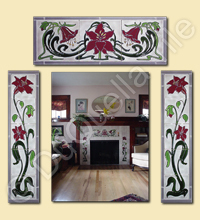 Your ceramic tile is made specifically for your fireplace surround and hearth. 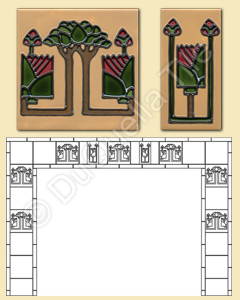 Take advantage of our nearly 20 years of experience designing fireplace surround tile. We will listen to your ideas and vision for your fireplace tile and work with you to develop just the right mix of decorative tile and plain field tile. 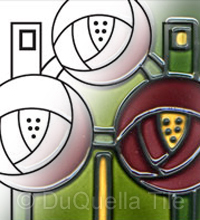 Our GEOMETRIC BORDER TILES also have corner tiles and end caps which make them a wonderful option to use around the opening of your firebox. 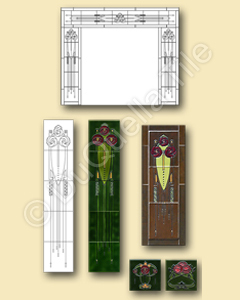 Our TILE SETS can be developed from any of our square tiles design or even our border tile designs. 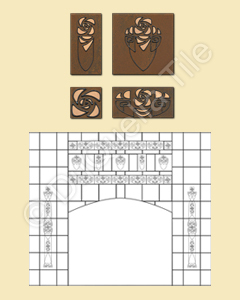 These sets are ideal for a focal point above the firebox opening. Start your exploration for your fireplace tile in our square tile collection! If you have checked out the links that we have suggested, you see that the possibilities are numerous. We can help you with that. Working with fireplace surround tile, one size does not fit all. We can help you with that. You want tile that is unique, that expresses your taste and style. We can help you with that. Choosing fireplace tiles that are a good fit your fireplace can seem overwhelming. We can help you with that. Your fireplace tile will fit as if the fireplace were built just for your tile. When, actually your tiles were made just for your fireplace!